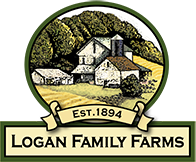 Beef – Logan Family Farms, LLC. Our goal is to produce the best tasting Natural Dry Aged Beef that will make your eating experience a pleasure. Natural Locally Raised and Dry Aged Beef – Home grown freshness and a taste that you won’t forget! All of our products are locally raised and naturally dry aged. Our family members directly oversee every step of the beef production process to ensure a premium product for you. Whether you would like a steak for the grill or special dinner or just feeding your family beef that you have confidence is raised humanely on home grown forages, we have it. No hormones, growth stimulant or antibiotics are used. You can learn more about our commitment by reading Our Promise. Dry Aging is the exceptional practice of letting the beef hang in a refrigerated cooler for an extended period of time that lets the enzymes naturally tenderize and enhance the beef flavor. Because the entire animal is “aged to perfection”, the roasts, ground beef, kabobs etc and of course the steaks, all have the flavor that you would expect from a high end steak house dinner. We dry age our beef and we do it for the same reason old time butchers used to let a carcass hang: it naturally tenderizes and enhances the flavor of the beef. Just like high end steak houses dry age their center steak portions, we dry age the entire carcass, taking all of our cuts to a superior level of tenderness and flavor. One cut of beef at a time, economic bundles or even beef for the freezer are available to meet your needs.